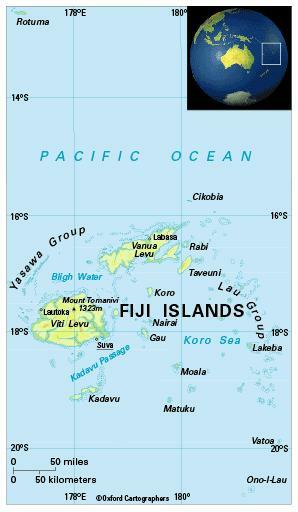 The Republic of Fiji lies 1,850 km north of Auckland, New Zealand, and 2,800 km north-east of Sydney, Australia. It consists of about 300 islands (100 inhabited) and 540 islets, spread over 3 million sq km. It is surrounded by the island groups of (clockwise from north) Tuvalu, Wallis and Futuna, Tonga, New Caledonia, Vanuatu and Solomon Islands. The largest islands are Viti Levu (‘Great Fiji’), Vanua Levu, Taveuni and Kadavu. The climate is tropical and oceanic. South-east trade winds prevail; day temperatures range from 20 to 29°C and humidity is high. The rainy season is November to March throughout the country, though there is rain from June-September. On average, the country is affected by a hurricane every other year, for example Cyclone Ami in January 2003. Environment: The most significant environmental issues are deforestation and soil erosion. 875,000 (2012); 53 per cent of people live in urban areas. The population growth rate stood at 0.8 per cent p.a. between the years of 1990 and 2012. In 2012 the birth rate was 21 per 1,000 people (34 in 1970) and life expectancy was 70 years (60 in 1970). More than 50 per cent of the people are ethnic Fijians, who are of mixed Melanesian-Polynesian origin, and most of the rest are of Indian origin. There are small populations of Europeans, Banabans, Tuvaluans and Chinese. Fiji is classified as a lower-middle-income economy by the World Bank.